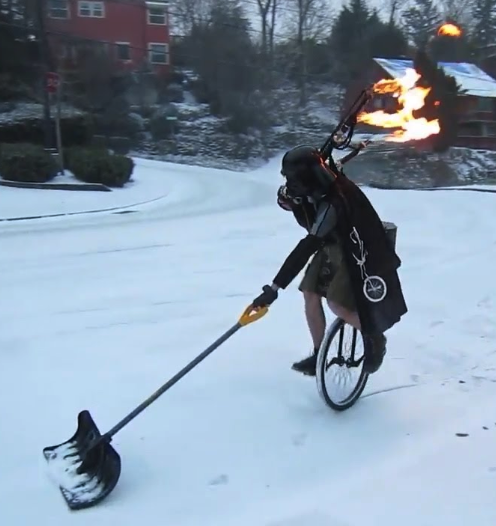 Have You Shoveled From The Recent Snow!? January 14, 2019 / / Comments Off on Have You Shoveled From The Recent Snow!? The owner of property immediately adjacent to a public sidewalk is responsible for the removal of any snow or ice that accumulates on the sidewalk. Removal must be done within 48 hours after the ice forms or the snowfall ends. For example, if snow stops falling at 8:00 a.m. on a Sunday morning, then by Tuesday morning at 8:00 a.m., the sidewalks should be clear or the property owner could potentially face a citation from the city’s Code Enforcement division. In the event that removal of ice is impossible, the property owner is required to place sand on the sidewalk within 48 hours. In a situation where a property owner fails to comply with the ordinance and the Development Services Department receives a complaint, a citation will be written. Property owners will be assessed a fine of $20 for each day the violation occurs, plus $63 in court costs if found guilty of the violation. For more information on the snow and ice removal ordinance, contact the Development Services Department, (785) 832-7700. The Safe Winter Walkways program is seeking volunteers who can assist residents with sidewalk snow removal. 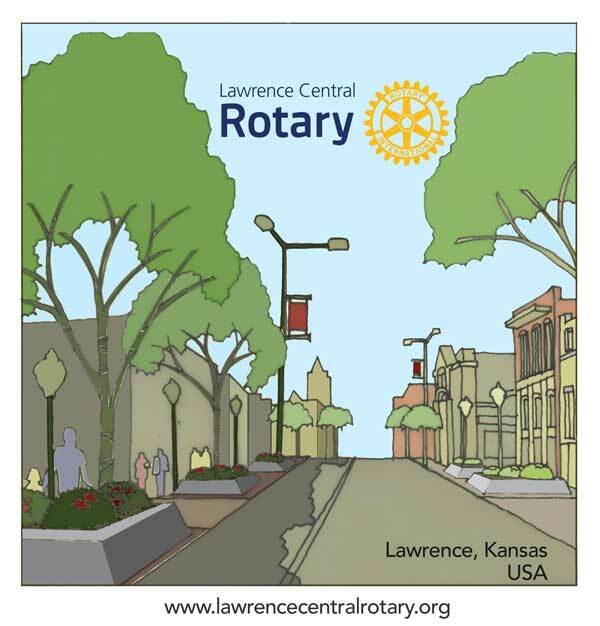 Safe Winter Walkways is a program provided by the City of Lawrence and the Senior Resource Center for Douglas County. For city snow operations and live traffic cameras, visit www.lawrenceks.org/snow. 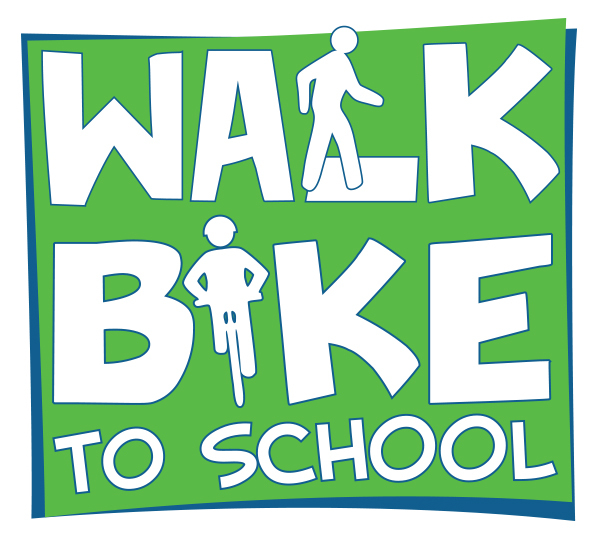 Are You Walking or Biking To School October 5th? October 3, 2016 / / Comments Off on Are You Walking or Biking To School October 5th? Lawrence-area students are once again dusting off their walking shoes in preparation for this fall’s annual Walk to School Day. Slated for Oct. 5, the global event encourages kids — and their parents — to walk or bike to school on a designated day each year. All Lawrence elementary schools — with the exception of Pinckney, which has moved students to Lawrence’s East Heights School while undergoing renovations — are participating in this year’s local celebrations, says Michael Showalter, the Lawrence-Douglas County Health Department’s health promotion specialist. The health benefits of walking, he says, are obvious. In addition to spurring more physical activity overall in kids, studies link walking with helping to maintain healthy weight, blood pressure, and bones, muscles and joints, Showalter said. There’s also, he said, the promise of social interaction that kids won’t find in a car commute. “It’s about togetherness and connecting with your community and your friends,” says Showalter, who also coordinates the Health Department’s Safe Routes to School program. He has seen plenty of groggy kids in school parking lots rolling themselves out of Mom’s car in the same way they’d sluggishly roll themselves out of bed in the morning. Walking, Showalter says, wakes students up, creating a mindset that is ready to engage in learning. Last year, “we had over 3,000 students,” mostly at the elementary-level, participate in Walk to School celebrations in Lawrence, he says. This year, the Health Department and its partners are widening their scope to Eudora Elementary School, where kids will end their walking journey to school after meeting first at the Eudora Public Library and using the new shared-use path that runs behind the school. In Lawrence, Sunset Hill Elementary School is offering muffins and juice for walkers, while Langston Hughes Elementary School is celebrating with music and prizes. New York Elementary School students are invited to meet staff and Principal Nancy DeGarmo at Hobbs Park (702 E. 11th St.) at 7:30 a.m. for an en masse walk down 11th Street and eventually New York Street to the school. Local Walk to School Day events are coordinated in partnership the Health Department’s Safe Routes to School program, with the city of Lawrence, the LiveWell Lawrence coalition, Lawrence Public Schools and the Lawrence-Douglas County Metropolitan Planning Organization. Showalter encourages parents to reach out to their schools for more information, or to contact him directly at 843-3060 or mshowalter@ldchealth.org. Schools are also posting Walk to School Day events at www.walkbiketoschool.org. What are you doing for Bike Month? May 11, 2016 / / Comments Off on What are you doing for Bike Month? National Bike to Work Week is May 16-20. Try bicycling to work and encourage your co-workers to do the same. 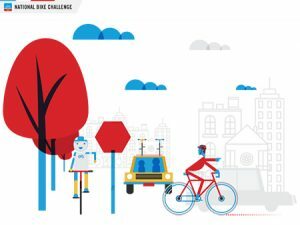 Lawrence is participating in the National Bike Challenge – a nationwide event to unite thousands of current bicyclists and encourage new riders. Sign up at www.nationalbikechallenge.org to join the challenge to track your miles or sign up a team to compete with your friends, family or co-workers. Take a ride with the City Commissioners on Tuesday, May 17. Meet at City Hall at 4:30 to take a quick ride around town to celebrate National Bike Month. Take the Confident, Capable Commuters Class through Lawrence Parks and Recreation. Learn how to ride safely in traffic, basic bike maintenance and much more. Contact smason@lawrenceks.org or call (785) 832-7950 for more information and class times. 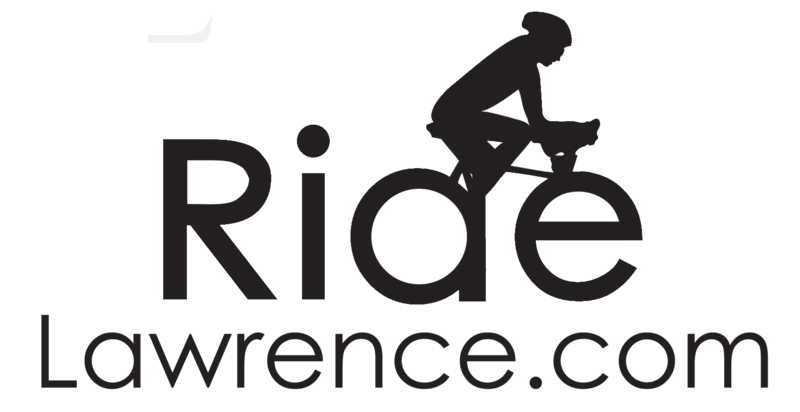 Sign up for the week-long Youth Cycling Camp through Lawrence Parks and Recreation in June. The Lawrence Public Library’s Summer Reading program is encouraging people to participate in Bike Middle Earth – a fun way to combine your love of reading with staying healthy. Find out details on the program at www.lawrence.lib.ks.us/walkingtorivendell/ and log your miles to Middle Earth. Tune up your bike at a free bike stand around Lawrence. There are four locations now with five more planned soon. Track your routes ahead of time by using the city’s online Bicycle Rideability Map or pick one up at City Hall, KU Parking and Transit, Cycleworks, Sunflower Outdoor and Bike Shop or Ambler Student Recreation Center. Take your bike on the bus – by combining transit and bicycling, you can get farther in Lawrence without using your personal car and saving that gas money for something else. Lawrence Parks and Recreation Department is offering youth the opportunity to be physically active throughout the afternoon, as well as learn bicycle safety through its new summer camp offering Youth Cycling Camp. 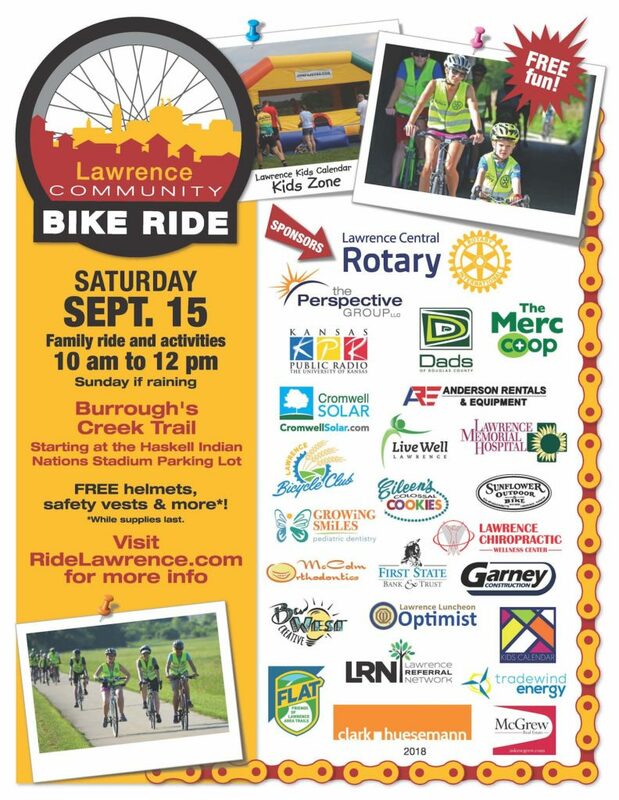 This week-long camp will provide participants with the opportunity to explore some of Lawrence’s parks through bike rides. Camp will be headquartered in Hobbs Park, 702 E. 11th St., and travel will be done on sidewalks and there will be a focus on safe riding and street crossing to other community parks where children will participate in games and craft activities. 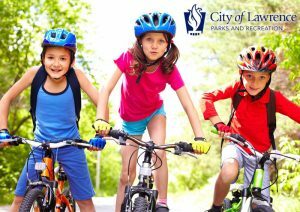 Youth Cycling Camp is open to children eight years-old to 12 years-old and is being offered noon – 5 p.m. Monday-Friday, June 6-10 and June 20-24. Cost is $90 per child, per week. All participants must provide their own bike and helmet. In the event of inclement weather, camp will be held at East Lawrence Recreation Center, 1245 E. 15th St.
To register online, please visit: http://lprd.org/activity?n=3257000 or visit any Parks and Recreation facility, including: Sports Pavilion Lawrence, 100 Rock Chalk Lane; the Community Building, 115 West 11th St.; East Lawrence Recreation Center, 1245 East 15th St.; Holcom Park Recreation Center, 2700 West 27th St.; Lawrence Indoor Aquatic Center, 4706 Overland Drive, Prairie Park Nature Center, 2730 Harper St. or the Administrative Offices, 1141 Massachusetts St.
For more information on the camp, please contact Stephen Mason, recreation center programmer, at (785) 832-7950.